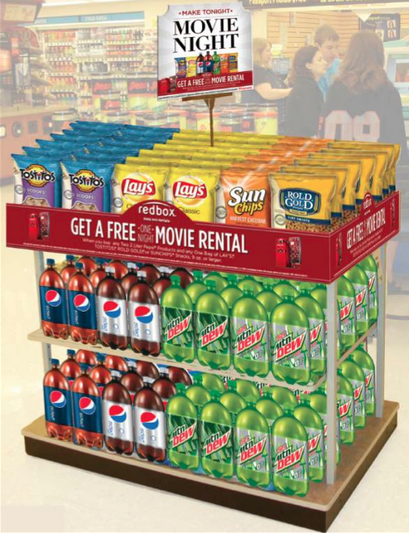 Research showed that 49% of Redbox customers also purchased beverages and snacks when they rented. The win-win “Movie Night” cross-promotion aimed to enhance this experience by bringing together consumers’ favorite movies, snacks, and beverages in one convenient retail location while driving sales and profitability for the brand partners with an enticing rental offer. › Leveraged the popular movie night occasion and an appealing free 1-day rental incentive with purchase to capture consumer attention and engagement. › Partners combined resources and maximized consumer reach with an integrated support plan that included national radio, circulars, in-store displays, social media, email, and vend screen messaging.